For true Stooges fans, “Rare Treasures from the Columbia Pictures Vault” offers a rare insider’s look at the expansive careers of the entire Three Stooges. 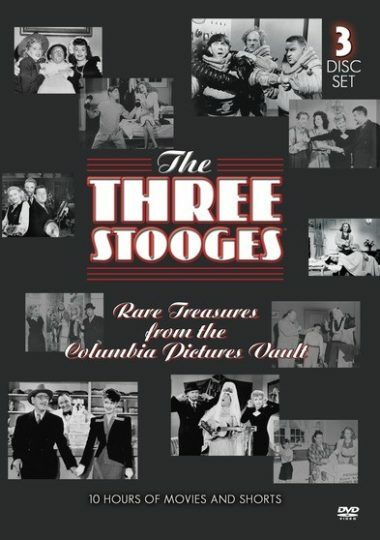 This 3-disc set includes two full-length feature films with the three original Stooges (Moe, Larry and Curly) and the three final Stooges (Moe, Larry and “Curly” Joe DeRita) and rare solo comedy shorts featuring Shemp Howard, Joe Besser and Joe DeRita as they develop their comedy skills allowing them to later replace Curly in The Three Stooges Trio. With over 10 hours of movies and shorts, this comprehensive set is the most anticipated collection for diehard Stooges fans ever assembled in a single package! Newly remastered. 3 DVD Set.